Well ... I guess I can post this now. 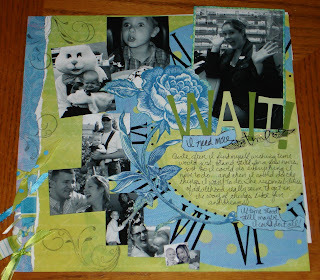 It's the actual page I sent to Memory Makers Magazine for their annual design team contest. The theme was "I wish" I wished for more time. 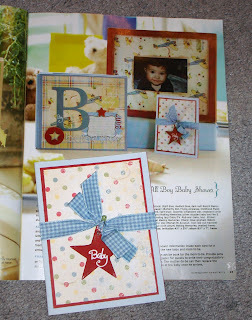 My pal Scrappy Nan has been chosen to be a Design Team member for The Red Bee scrapbook and crafts store in Tustin, CA. 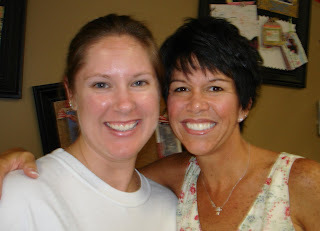 A big congratulatory hug for her as she embarks on her first (not including Zutter Zisters, of course!) DT tenure! I can't wait to see what she creates for them! To find out more, log on to her blog (listed in my favorite links) or Red Bee head design team member Donna Salazar's blog! and loving it! The slower pace really lets me relax and recharge! While it is a bit hot and humid, air conditioning makes any place bearable! And the evenings are just gorgeous! But one thing about Pittsfield, IL, if you don't like the weather, just wait three days - it will change! 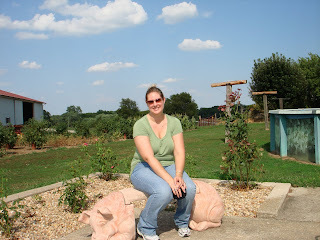 This photo is me of me on my Aunt Brenda's new pig bench in her backyard. She has a thing for pigs, so as a thank you for letting the entire family (and it's a big family) crash her swimming pool this summer, they got her this pig bench she has had her eye on! As for scrappy news, I am touring four of the Midwest's scrapbook stores, teaching Bind-it-All classes ... it's been a lot of fun! Check out the details on the Zutter Zister blog: www.zutterzisters.blogspot.com! This arrived a few weeks ago, but I couldn't find the photo! I finally found it, so now I can blog about it ... my CKU Anaheim Secret Sister, Joyce, had said she had one more SS gift to give me, but that it did not arrive in time for CKU. She was more than generous both before and during CKU, so I completely forgot about the last gift she had mentioned until she asked for my mailing address a few weeks after CKU. 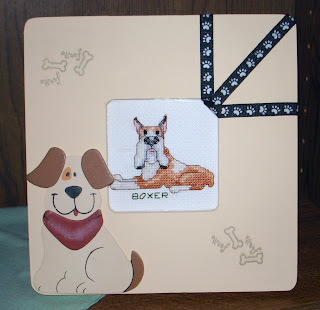 This framed cross-stitched boxer puppy arrive a few days later. Terribly thoughtful, as I LOVE boxers - I have three LIVE ones and have owned the breed for more than 10 years. So, again, a BIG thanks to my SS and her incredible thoughtfulness! C2R August was much more productive than C2R April! I got 24 layouts done this time - compared with 2 last time! I think Nan, Naomi and I finally have the crop thing down now and could relax a bit more! We had yet another great group of gals, one as far away as Colorado. The photo above is my layout for the Layout Challenge Contest. Each cropper was given a 12 x 12 sheet of quilt-looking paper, three mini file folders, a charm and a length of ribbon to create a page with. We could only use three items from our stash, but any tools we wanted. To see more of the layouts, visit www.crops2remember.com! BIG sigh ... and then a shout of glee! Ah, yes, it has launched! Kits2Remember.com is now live and I invite you to cruise around. Considering I was laid off from my "real" job about three weeks ago, this is what I have been doing for work, among other scrappy things. I am also heading to the midwest to not only attend Rodney's cousin's wedding, but to also visit three LSS in the area and spread the Bind-it-All knowledge around the country! 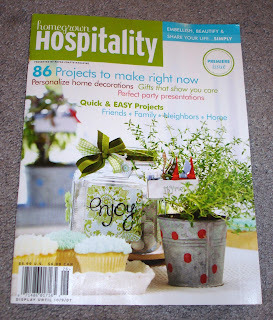 I had the pleasure of attending the launch party for CK Media's newest magazine: Homegrown Hospitality! A lot of crafts are featured within its pages, including paper crafts, work with felt, wood, all sorts of things. But the best part is that it is featuring the work of a very talented local, Stephanie Ackerman! Stephanie recently got married, but she has been in the scrap world for quite some time, designing for Me & My BIG Ideas, as well as having a seat on the design team for Timeless Treasures in Rancho Santa Margarita. Timeless hosted the launch party yesterday, where Stephanie was quick to sign autographs and was incredibly patient through all the picture taking and chat. 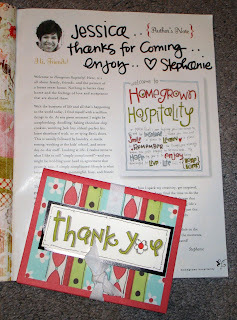 Stephanie also gave away a lot of the projects featured in the premier issue of Homegrown Hospitality and I was fortunate enough to get two of her cards: A Baby card and a Thank You card. After flipping through the magazine and seeing how many projects were in there, I can understand the amount of hard work that went in to the issue. Thanks to my newspaper experience, and the organization that needs to go into big "events," I can appreciate everything Stephanie has done and she deserves a huge round of applause!